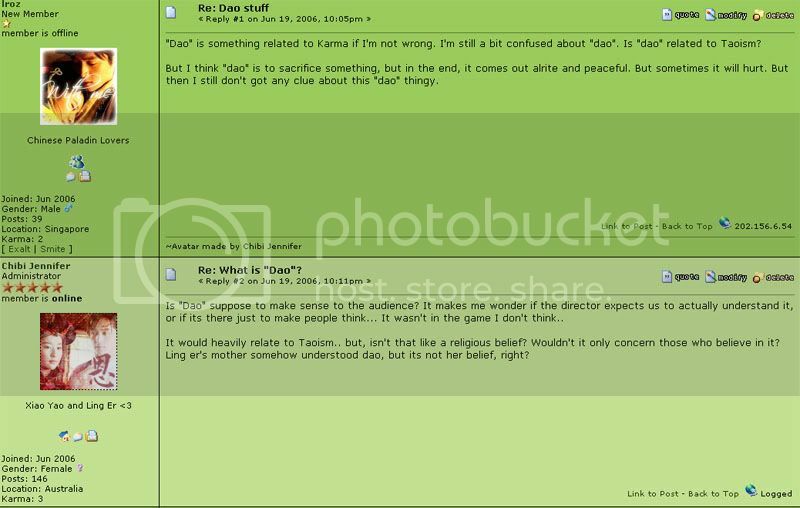 Did anyone actually enjoy those &quot;Dao&quot; episodes? nope.. didn't know what they're talking about. Nope..too boring, I wanted to watch the others. 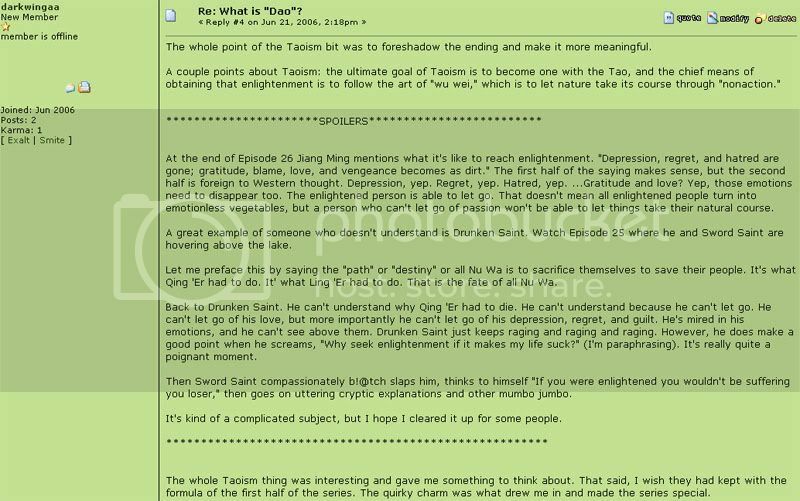 The "Dao" episodes fricking made no sense. I got so confused when I watched it for the first time. 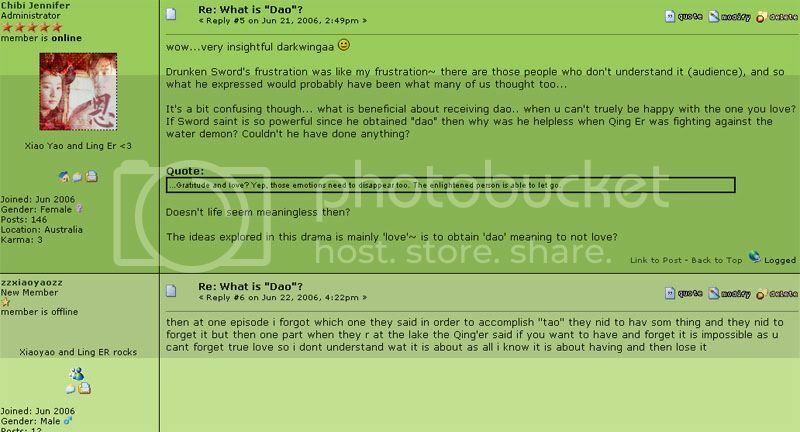 Well by watching the show, "Dao" seems to be "The way" like.. your destiny or fate, I dont know much other than that but from the way they talk about it, that seems about right. 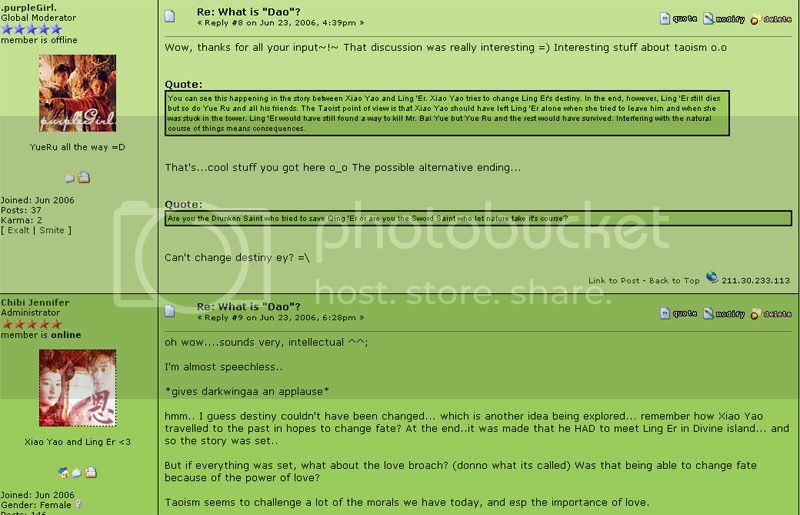 hannah crystal wrote: what is dao????? "Dao" cannot be explained. Those who understand "dao" cannot explain it as those who do not understand dao cannot comprehend the explanation. It is like explaining what water is to someone who has not seen, heard or touched it. 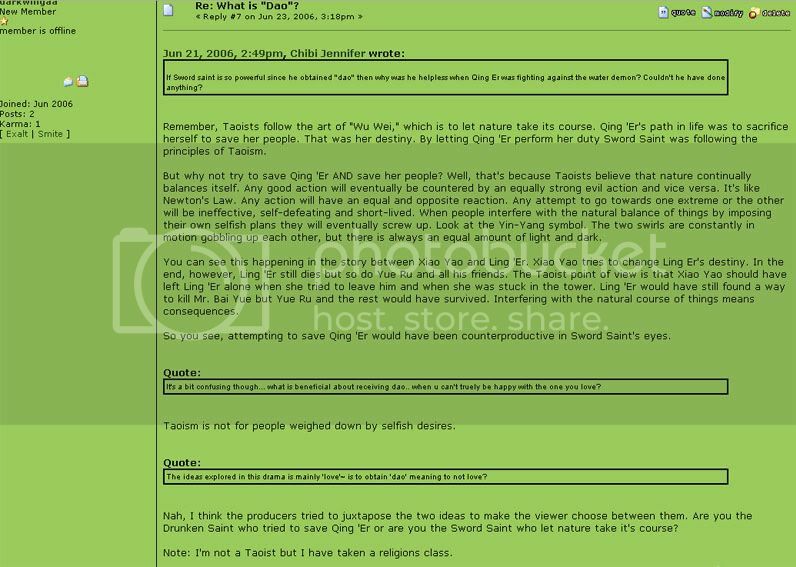 When The sword immortal (Yin Ruo Zhuo) finally understands dao you see parts of his life (or ego) fall as drops into the lake, he is but a drop in a stream of consciousness. It's the ultimate realisation, the meaning of being or infact of not being! Liu Shen Bing wrote: "Dao" cannot be explained. Those who understand "dao" cannot explain it as those who do not understand dao cannot comprehend the explanation. It is like explaining what water is to someone who has not seen, heard or touched it. YEah. Guess you are right. Dao cannot be explained. When you see your life part by part, you might realised that many things couldn't be solved with knowledge. I think the only way is to put it aside and understand it slowly with your heart. The sword Saint in the show mentioned that " 既然懂得拿起,为何不懂得放下". It means that if you know how to start doing something, why not put it aside when it is completed or failed. I feel that he was right. This is the only way we could reduce our burden. If not our burden will increase slowly as we proceed with our life.